Donald Trump does not have many policy ideas of his own. But he does have handlers, and behind-the-scenes influencers, and Trump whisperers who have plenty of radical notions that they’ve been salivating over for years. In the first few days of his presidency, they have had Trump on a signing rampage–lurching from one policy to another with a lot of fanfare, but very little explanation. The question is, where do these “ideas” come from? There’s plenty of empirical evidence that indicates Trump’s lack of knowledge of domestic and international issues. He has no experience in government. He does not begin his presidency with the kind of policy agenda that most presidents have: He hasn’t thought about any of the issues that are facing the United States–except for issues that might affect his businesses. We know that he doesn’t like to read, and that he thinks he knows a lot more than he actually does. 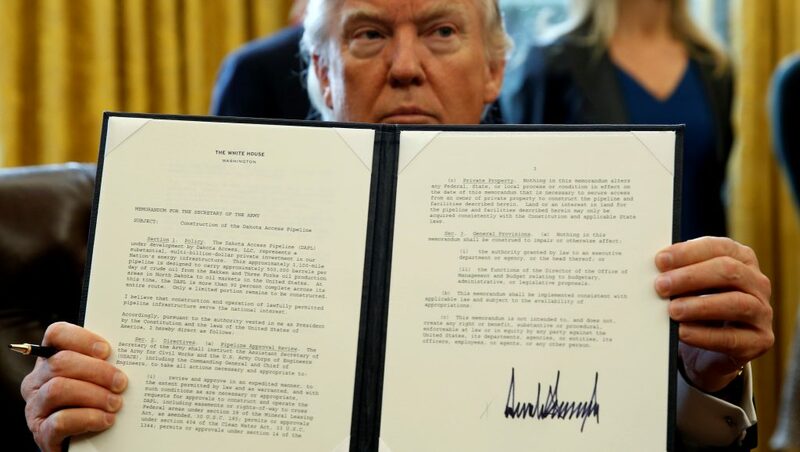 So, during Week One, the Trump whisperers have trotted him out, sat him at his desk, placed executive orders in front of him, handed him a pen, and showed him where to sign. Trump’s main role in these daily charades is to pull out a Sharpie, affix his name to the bottom line and show off to the press and observers what he clearly thinks is his cool, bold, presidential-looking signature. So, I’m proposing a little guessing game: Match the executive order, regulatory change, event or threat with the Trump-whisperer who’s pushing it hardest. Admittedly, some of the things that have happened in Week One of this frightening presidency probably sprang from Trump’s own two-clicks-off brain. We sense that because some of his Week One moves are clearly the result of a lack of impulse control. [Case in point: Calling for an “investigation” of massive “voter fraud,” even though he won.] These things happen, probably, because Trump throws a tantrum and insists on them, and then is either egged on by advisers who share his anger, or allowed to have his way because no one has the courage to tell him that it’s a bad idea. Ready to play? Here’s a start–all speculation on my part, but I may not be too far off. [I’m punctuating my picks with question marks, because I really don’t know–it’s all done behind the scenes. In fact, we may never know.] I haven’t included Fox News [Scarborough and Hannity], although it has become clear that Trump watches a lot of tv, particularly those guys, and gets a lot of affirmation from them. Please feel free to add your own ideas in the comments. Global Gag Order [Abortion] Pence? Gag order on Government Agencies Bannon? Proposed meeting with Israeli Prime Minister Benjamin Netanyahu Kushner? Executive order on ACA/Obamacare repeal Pence/Ryan/McConnell/Preibus? "Conciliatory" visit to CIA Conway? Preibus? Kushner? Limiting press access/Moving press out of White House/Selecting reporters to include in briefings Bannon? Combative, dark inaugural speech Bannon? Building the wall on Mexican border This may actually be Trump's own idea, but egged on by Bannon? Banning refugees from Syria and countries where "terrorism" is a problem Bannon, Pence, Trump? Authorizing the re-instatement of torture as US policy Pompeo [new CIA chief] ? Erik Prince [of Blackwater mercenary fame]? Re-instating the DAPL and Keystone XL pipelines Pence/Ryan/McConnell/Obama haters/Tillerson/Trump [he has an investment interest in the pipelines]?